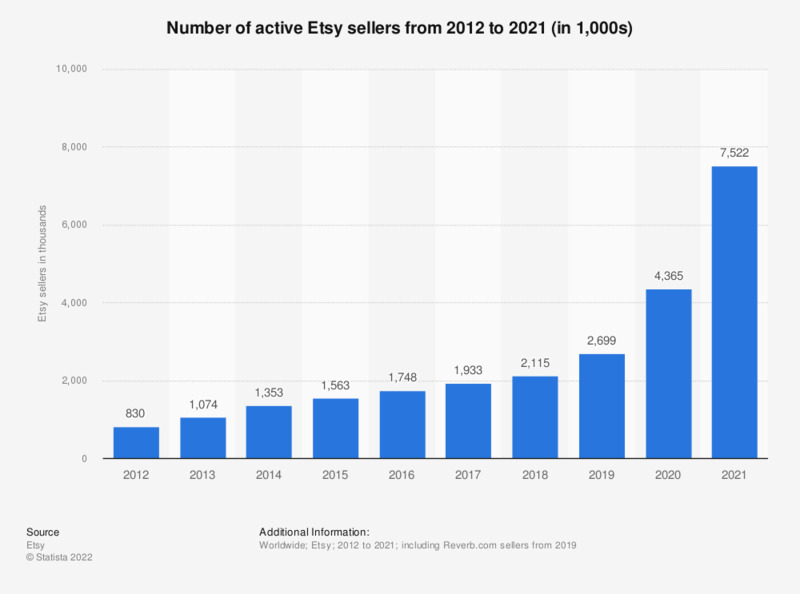 This statistic represents the number of active sellers on social commerce platform Etsy from 2012 to 2018. As of 2018, more than 2.1 million sellers sold goods through the Etsy ecosystem, up from 1.9 million in the previous year. An active seller is an Etsy seller who has incurred at least one charge from Etsy in the last 12 months. Charges include transaction fees, listing fees and fees for Direct Checkout, Promoted Listings, Shipping Labels and Wholesale enrollment. An Etsy seller is a member who has created an account and has listed an item in Etsy's marketplace. An Etsy seller is identified by a unique e-mail address; a single person can have multiple Etsy seller accounts.